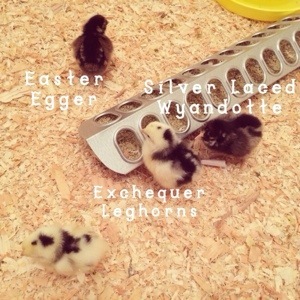 the welsummer, easter egger, jersey giant, exchequer leghorn one and two, and the wyandotte. Six little chickens, growing up so fast! 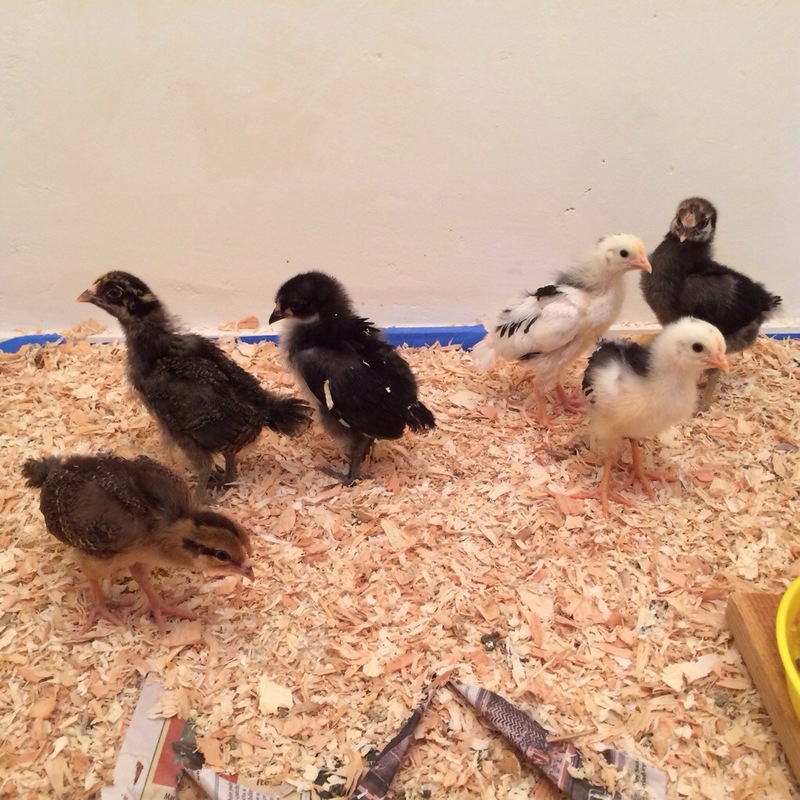 The chicks, at just over two weeks old, are no longer little fluff balls of peep. They look more like scraggly wrens or sparrows or birds that live in trees and fly around. We haven’t named them yet, although we’ve bandied some options around. Like Mrs Weasley and Professor McGonagall. But since they’re all different breeds (except for the two leghorns), we’re slacking on that opportunity for naming twee-dom. They are quite skittish and get very alarmed as soon as they’re aware that we are looming. So we haven’t manage to tame them into proper pets. Once you’ve caught one, they’re generally docile and seem happy to sit with you and snooze. It’s quite pleasant to have a little bird in your lap, although poop does happen on the regular. Feathers are coming in like crazy. First on their wings, and then little tails. 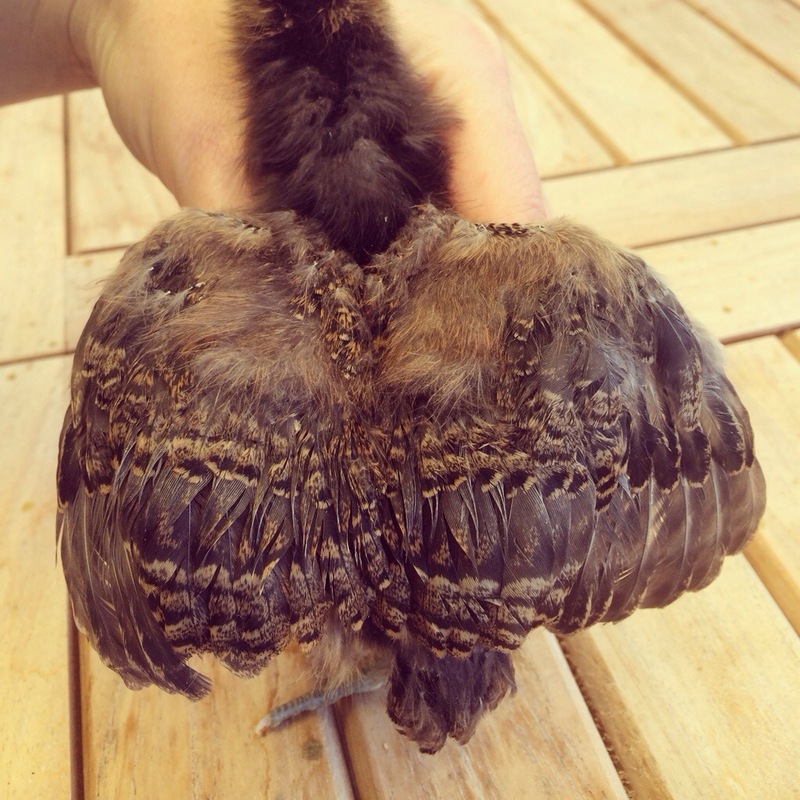 The rest of their bodies are getting a bit scrotty-looking as they transition from downy fluff to feathers. They are very busy scratching and kicking up and rustling about in their pine shavings, which means we are very busy changing their water, at least twice a day. They’re supposed to be kept around 85 degrees (down from the 95 degrees of their first week of life). Who knows if we’re managing that, but so far, they’re all alive. The pea pod shells I offered them were treated like hysteria-inducing alien intruders. Until they forgot that they were there and then they just walked around on top of them. Another two, maybe three weeks, before they get to move outside to the coop. Which the David is building himself, with a plan he’s devised himself. Which has been, let’s just say, a learning experience. Since we bought our house (complete with our own little patch of mostly concrete-covered land!) last August, we’ve ruminated on all kinds of plans for what we could do in our yard. All of of which are some poor iteration of the dream of dreams: owning a goat farm in the French countryside. Since we’re not moving to France, we decided to go a little more urban homestead and get chickens for our Oakland backyard, instead. There was much deliberating and reading of the internets. 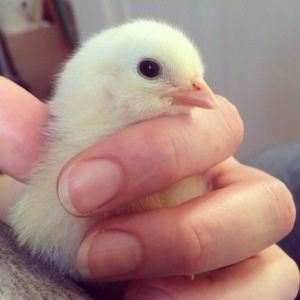 Then we took a class, which helped to alleviate most of the concerns we had about how hard it would be and then we ordered some chicks online that same night. 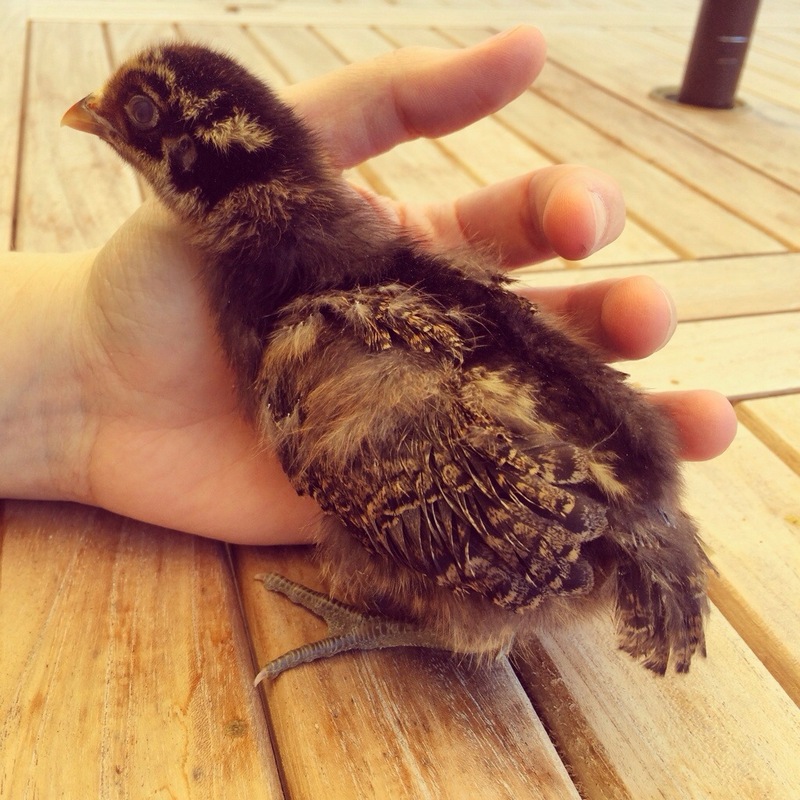 We decided to get new-born chicks, instead of younger (called pullets) or full-grown birds, since you then have a better chance of raising friendly, handleable chickens. And by ordering online, I had a lot more option as far as breed selection. I filtered for breeds that were known to be friendly and less likely to get broody. I also opted out of any bantam sized chickens, so we’d have a flock of similar-sized birds. We felt like 3 or 4 chickens would be a good number, so we ordered 6 chicks, assuming that they might not all make it. 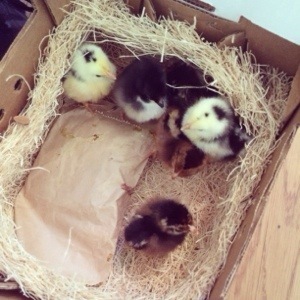 Each chick cost about 5 dollars. But the overnight shipping was 50. 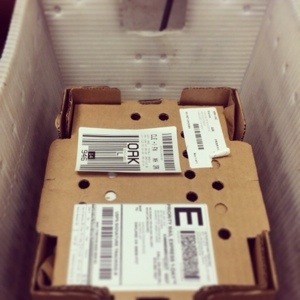 The chicks shipped already hatched, so they could be sexed and we’d only get lady birds. Very hard to imagine a box of birds shipping in the mail, though. How could that possibly be ok? Excited and curious, we high-tailed it over to our local post office when they called to say that our delivery had arrived. Then we waited in line for the package pick-up and the lady, who had seemed very dour and annoyed at the world, totally smiled when we told her we were here to pick up some chicks. She came out with a peeping box inside of a USPS crate. 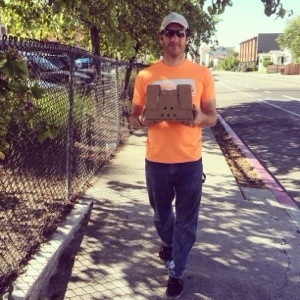 We carried the box the few blocks home. It peeped. I could just barely make out some little creatures through the air holes. Once we got inside, we opened up the box, and lo! Chicks! All alive, all peeping. They came packaged up in a bed of straw, with a little hand-warmer heat thing in paper bag. They’re living in an empty closet in the Room of Shame (a spare bedroom, full of unpacked boxes). The chicks will live inside for 4 to 6 weeks, until they are dressed in their full on feathers, with no fluff. Not pictured: a black Jersey Giant and a Welsummer. They are unbelievably cute and do ridiculously adorable things. Like losing their balance and falling over when scratching their heads. Or settling down to fall asleep and then just drifting off into a face plant splat. They do not like hanging out with us so much and are pretty scared when they see us getting in their space, but I’m hopeful that given some time and more handling, they’ll adapt and be our friends.